Here’s another dreamy, relaxing video of fish on the River Tame. In 2016, Tame Valley Wetlands Landscape Partnership led a project to recreate a back channel and reinstate an island feature at Tameside LNR, Tamworth, Staffordshire. The back channel was created to serve as a fish refuge for small fish and fry, giving them a place that they could shelter, feed and grow within the dynamic River Tame environment. 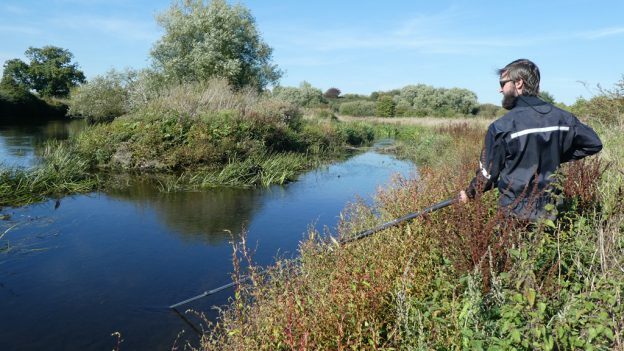 Within the first summer, instream vegetation grew within the channel, offering ideal habitat for our target fish. Two years on and the banks have established wonderful riparian plants, suitable for water vole should they return and the in channel vegetation is both submerged and emergent, which is great shelter for fish. Our film evidences that minnow, gudgeon and fish fry are present within the refuge. A job well done for securing an essential environment to support natural recruitment of freshwater fish in our big river systems. This entry was posted in Featured, Latest News and tagged fish, Jack Perks, river tame, Tameside on 1st October 2018 by Sarah.